TWRP (Team Win Recovery Project) is one of the most popular and one of the best custom recovery available for Android. It’s a touch-based recovery comes with many cool features including a file manager and terminal emulator. It is a most widely used recovery that supports many official and unofficial devices. With TWRP you can flash custom ROMS, modem and firmware files also you can backup and restore your current ROM. After a long time, TWRP gets a major update with many bug fixes and many new features. The new update of TWRP 3.0.0 has a complete new look, true terminal emulator, support Android 6.0 and now you can flash image files also. With the massive list of the changelog, everyone excited to try this latest recovery. So we decided to post a simple guide of how to install TWRP 3.0.0 on Android Phones. This is the official release of the awesome TWRP to all supported devices. There is more than one method to install TWRP 3.0.0 on Android Phones, and we cover all of that so you can choose what best for you. 2) For this method, you have to install ADB and Fastboot on your PC first. Check this How to setup ADB and fastboot on Windows or Setup ADB and fastboot on Mac. 3) Download TWRP 3.0.0 image file, rename it to recovery.img (optional) and place it in a folder where adb and fastboot installed. 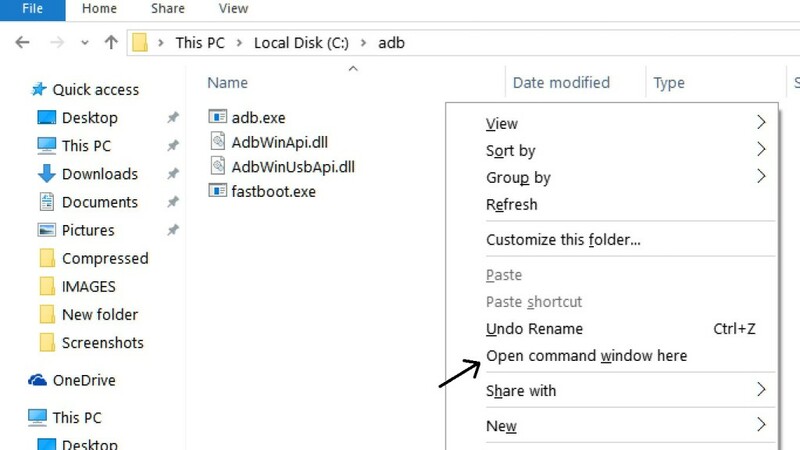 4) Now go to installation directory open ADB folder and open the command window there by pressing and hold the ‘shift’ key and right-clicked anywhere in that folder. 7) Type this command correctly in command prompt “fastboot flash recovery recovery.img” and then press enter. It will update TWRP recovery to v3.0.0. 8) Now type “fastboot reboot “ in command prompt it will restart your phone. 2) Download TWRP 3.0.0 image file. 3) Now open flashify and it will ask for SuperSu permission, grant it. 4) Now in the main page click on recovery image and choose recovery.img file or twrp.img file. 5) Now click ok to flash TWRP 3.0.0 recovery on your device. 1) For this method, you must have rooted phone and custom recovery installed. 2) Download TWRP 3.0.0 zip file. 3) Reboot your phone into Recovery mode by pressing a combination of buttons. 4) Now in recovery mode select the ‘twrp.zip’ and swipe to flash the recovery. That’s all, and this is the complete guide of how to install TWRP 3.0.0 on Android Phones. And with the help of above all methods, you can easily install TWRP 3.0.0 on Android devices. If you have any questions from above approaches comments below. My device is not mentioned .I.e Micromax canvas a311 so which one should I download? Micromax canvas A311 is not officially supported. im using 4.2.2 jelly bean cherry mobile edge and i cant find supported files. is there any option that i can used on my android phone? plz help micromax q336 custom recovery…? TWRP 3.0 For Oppo Mirror 5?? can u help me please..
My device name not found that like Wham how can install through flashify app. operable program or batch file how to fix ? How to install TWRP recovery on vivo v3. Out Beyond is not listed in custom recovery list. What to do?